As a child she came to Berlin, where she studied singing under the pedagogue Emmy Raabe-Burg. She made her debut at the Hofoper in Berlin (1913-1914). There she sang among other things the part of Tebaldo in G. Verdi's ''Don Carlo'' and participated in the Berlin première of ''Parsifal'' (1914). 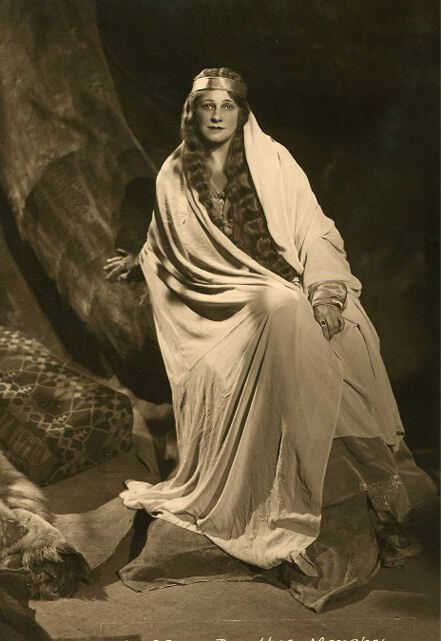 In the 1914-1919 seasons she appeared at the Nationaltheater in Mannheim (among other things in 1917 the title role in the premiere of ''Sharazade'' by Bernhard Sekles). In the 1919-1921 seasons she was a soloist of the Staatsoper in Stuttgart. In the 1922-1926 seasons she was engaged by the Berlin Staatsoper. In 1927 she joined to the ensemble of Metropolitan Opera in New York (debut: Witch in ''Hansel und Gretel'' of Humperdinck). She appeared at the Metropolitan Opera from 1927 to 1941. Here her repertoire included Elsa in ''Lohengrin'', Venus in ''Tannhäuser’', Ortrud in ''Lohengrin'', Gutrune in "Götterdämmerung", Chrysothemis in ''Elektra'' of R. Strauss, Herodias in ''Salome'', Giulietta in ''Les contes d'Hoffmann'' and as Marianne Leitmetzerin in "Rosenkavalier". In 1933 she substituted Frida Leider as Brünnhilde in "Walküre". Nevertheless, her star role remained the witch in ''Hansel und Gretel''. In 1930, 1935 and 1936 she performed at the San Francisco Opera, in 1938 at the Chicago Opera. In the 1933-1934 season, during the Salzburg festival, she sang the part of Isolde in R. Wagner's ''Tristan und Isolde'' under Bruno Walter. In 1934 she appeared as a guest at the Staatsoper in Wien. In 1942 she became a professor of the Indiana University in Bloomington, where she also had her residence. The soprano Felicia Weathers belonged to her pupils. She was married the Swedish music critic Walter Brandon. Her daughter Inge Manski also became a successful singer.